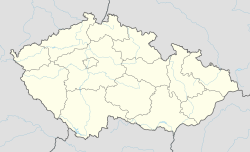 Varnsdorf (Czech pronunciation: [ˈvarnzdorf]; German: Warnsdorf, Upper Sorbian: Warnoćicy) is a town in the Ústí nad Labem Region of the Czech Republic, with a population of around 16,000. The town is close to the border with Germany, with border crossings to the Saxon towns of Seifhennersdorf and Großschönau, and is the second largest in the Děčín District. Pre-Schengen passport stamp for the border crossing into Germany. The village of Warnsdorf was first recorded in the fourteenth century, and it united with nearby villages in 1849 to form the largest village in the Austrian Empire. It was made a town in 1868. The town was one of the early sites of Old Catholic Church, and an Old Catholic cathedral remains a tourist attraction. The population has declined somewhat since its peak – the 1911 Encyclopædia Britannica gives it as 20,000, and noted it was a textile town. Prior to the end of World War I, Warnsdorf was part of the Austro-Hungarian Empire. Following that war, the Treaty of Saint-Germain-en-Laye incorporated it, together with the region of Bohemia, into the new country of Czechoslovakia. Following the end of World War II, its ethnic German population was mostly expelled to Germany, and the official spelling of its name was changed from the German "Warnsdorf" to the Czech "Varnsdorf". Varnsdorf is also home to the Kocour Brewery, who make a range of ales, including American style IPA and a stout. "Warnsdorf" . Encyclopædia Britannica. 28 (11th ed.). 1911. p. 327. Wikimedia Commons has media related to Varnsdorf.